When we moved into our house one of the things I utterly did not like was the entryway. It was the door on the cul-de-sac that girls selling cookies wouldn't want to knock on. The bottom was chipping badly, frayed and scuffed. The whole thing looked dirty. In fact, the day after we closed on our house the first thing I did was get a stiff scrub brush and scrubbed down the entire entry...with red mud running down the walls. Yuck. However, since I mostly went in and out through the garage things on the inside of the house were more of a priority to get redone. We put a pretty welcome mat there and called it good. Last May we finally decided it was time to do something about the entryway. A brand new door was not in the budget, so painting was the obvious choice. After a lot of paint samples, determining what would look good if we left the rest of the exterior the same (the trim and garage door are gray as well...blah), or if we painted it to our preference (either an almost-white gray or a pale pale dusty blue), we decided on our entry colors. And we decided to go bold. Hey, it's just a door. We painted it in a day, and if we hated it we could always get a small can of paint and redo it again! Why not take a chance? 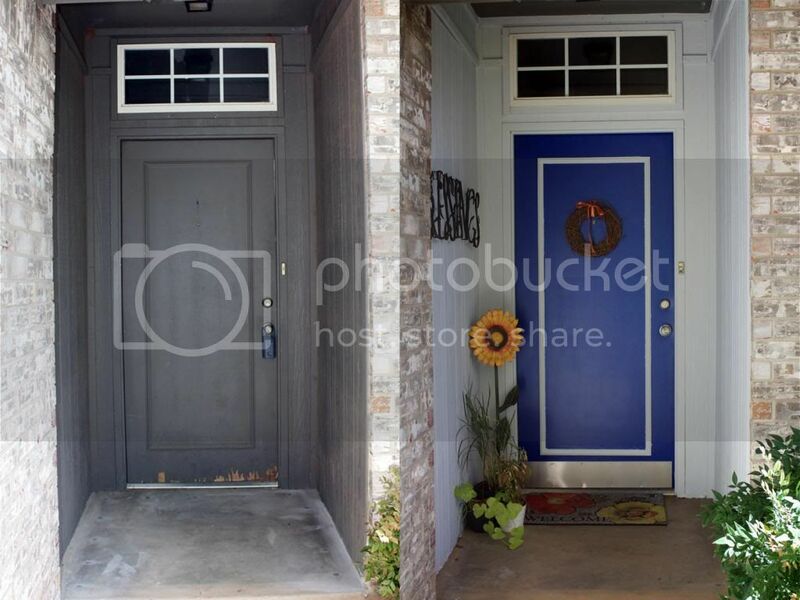 So we went with Behr's Jazz Blue for the door and Light French gray for the entry. Last May, while keeping a weather eye out during a tornado watch, we got the entry painted, and primed the trim on the front door. It was warm, muggy, and definitely not the best painting weather but we took what help we could get! We also changed out the doorbell, peep hole, door knob and deadbolt. So much brighter! However, summer quickly followed and my outdoor time was taken up by a rapidly growing garden (including out-of-control tomatoes) and not finishing the trim or adding the kick plate. So FINALLY, over a year and a half after moving into our house, I got the trim done and the kick plate on today. Now that's an entry I would want to go right up to! Good jon Kait, I like your jazzys. The space looks wider, and thanksgod, cleaner :-) I´m sure you have at least a good feeling entering your home now.